8/4522 Private Montague Edwards of the 34th Battalion, the Training Reserve, the Hampshire Regiment. Died 12 February 1917 at the Red Cross Hospital in Exmouth. Buried in the churchyard of St Margaret and St Andrew, Littleham, Exmouth. Previously employed at the South Devon Hunt Kennels, Pulsford, Denbury. 24025 Battery Sergeant Major John Gayler of the Royal Garrison Artillery. Son of John and Martha Gayler of Woodbury; husband of Maud Helena Gayler (née Pawley) of North Street, Denbury. Born in 1878. Died 20 April 1919 aged 41. 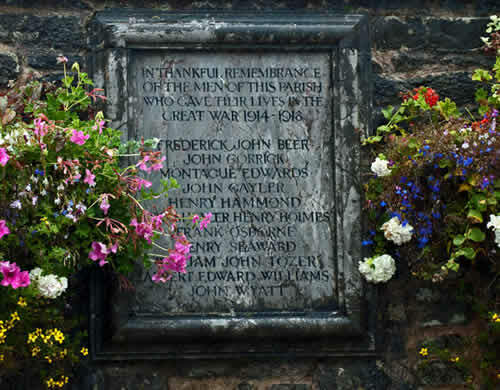 Buried in Denbury Churchyard. 377109 Lance Corporal Henry Hammond ("Pat") of the 2nd/10th Battalion, the Royal Scots, formerly of the 6th Battalion, the City of London Rifles. Son of the late William and Louisa Hammond of Peckham; husband of Martha Hammond (née Ellis) of Newton Abbot. Born in Peckham in 1879. Son of the late William and Louisa Hammond of Peckham. Died 8 October 1918 aged 39. 345346 Private William Walter Henry Holmes of the (16th Battalion, the Royal North Devon Yeomanry), the Devonshire Regiment. Son of William James and Mary Kate Holmes of Rose Cottage, Denbury. Born in Denbury in the December Quarter of 1897. Died 3 December 1917 aged 20. 8355 Lance Corporal Frank Ernest Osborn of the 2dn Battalion, the Devonshire Regiment. Son of John and Sarah Osborn of East Street, Denbury. Born in Torbryan in the September Quarter of 1889. Died 1 July 1916 aged 27. 30322 Private William John Tozer of the 7th Battalion, the Royal Inniskilling Fusiliers. Son of William and Sarah Tozer of East Street, Denbury. Born in Denbury in the December Quarter of 1888. Died 7 June 1917 aged 28. 177845 Able Seaman John Charles Wyatt of the Royal Navy, HMS Canopus. Son of Mrs. Susan Ann Morey of Lower Lake, Woodland and the late William Wyatt. Born in Holne in 1872. Died 11 May 1915 aged 43. 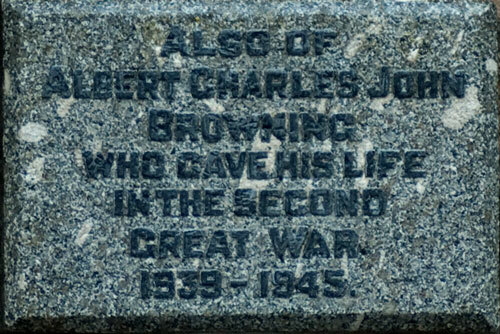 ALBERT CHARLES BROWNING PLY/X3748 Marine Albert Charles John Browning of the Royal Marines, HMS Barham. Son of Ernest Charles and Mary Naomi Browning (née Newton) of Denbury. Born in Denbury in the June Quarter of 1920. Died 25 November aged 21.